Great Australian Quilts #5 is packed with talented Australian quilters including Sarah Fielke, Michelle Marvig, Leesa Chander, Helen Rhodes and Denise Griffiths. 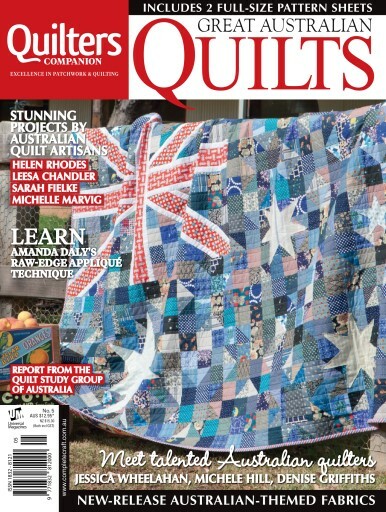 On the cover is Sarah Fielke’s stunning interpretation of the Australian flag as a quilt! You can also learn Amanda Daly’s raw-edge machine appliqué technique or make an amazing banksia quilt. Denise and Leesa both looked to the waratah for inspiration in creating their projects with two vastly different looks resulting. Karen Fail reports on the Quilt Study Group of Australia’s 20th anniversary and we meet award winning quilters Michele Hill, Jessica Wheelehan, and 14-year-old Clare Marshall. We profile the latest release Australian-themed fabrics, meet the very creative 84 Group, and feature the Stitched and Bound 2014 Exhibition as well as a special exhibition by Wilma Cawley and Beth Miller titled In the Garden.